We’d done our research on the new Bai Dinh Pagoda before heading there to check it out, and ‘new’ and ‘big’ seemed the most dominant adjectives being used, so we weren’t expecting much. Browse places to stay in Ninh Binh on Agoda.com. Free cancellation. However, we were pleasantly surprised: yes, it is new, and therefore lacking historical interest, and there is no denying it’s big -- the biggest pagoda complex in Vietnam -- but a visit is one of those fascinating Asian experiences that leaves you with memories just as strong as amazing scenery or an ancient temple. Parts of the pagoda complex are still being built, but most of it’s finished and ready to be explored. It’s built on a hillside with a number of different levels and lots of steps. However, the climb is enhanced by the hundreds of large stone Buddha statues which line the stairwells on either side. Other highlights include the two huge buildings housing equally huge statues and shrines. 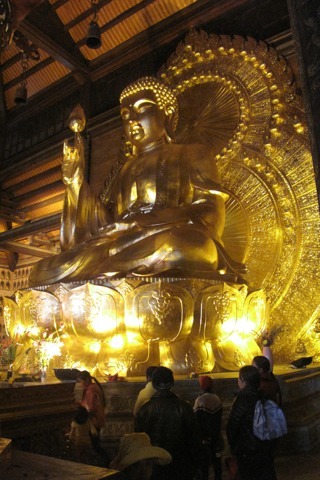 The size and sheer goldenness of the Buddha statues is quite jaw dropping. A multi-storey Buddhist tower is still being built at the very top of the complex, and just in front of that is a large status sat atop a hill. Beyond its size, a visit to the pagoda is an experience for a couple of other reasons. Firstly, it’s a popular destination with the Vietnamese, so at the weekend or special occasions in particular it is heaving with families on a day out and hence you will be immersed in Vietnamese family day out culture, deep fried frankfurters included, secondly, transport to the pagoda from the parking area is by golf cart which is just, well, fun. Especially when they try to overtake each other, proving that driving culture is ingrained, no matter what the vehicle. Should you go? We really enjoyed our visit, and if you have time and transport would recommend it, but it’s not to everyone’s taste, so don’t feel you have to change your travel plans. Entrance is free, but you’ll pay 30,000VND each way for the transport, on top of parking.